Throughout the years, there have been several side projects and research interests which—now that I have a webpage—I hope to introduce to those who read it. I have several unpublished manuscripts in my files which may see publication eventually in some form or another. While in graduate school, I prepared a 200 page report on the history of alcohol introduction among Northwest Coast Indians, and a 30 page report on “Doctor Killings” among NW Natives in the early 1800s. 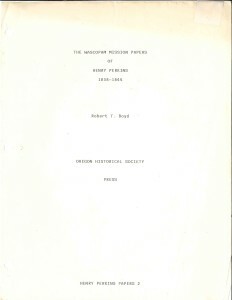 People of The Dalles, as published in 1996, was only half of a larger manuscript entitled “The Wascopam Mission Papers of Reverend Henry Perkins.” Only the chapters with Indian content were published: the biographical chapters on Perkins remain in manuscript. So do a few chapters that deal with Oregon Mission history beyond Wascopam, including a possible stand-alone piece on the 1838-39 Willamette Mission Revival. In 2002-04 I wrote an “expert report” for the Northwest Indian Fisheries Commission’s “Culverts Case” (decided in favor of the tribes) on traditional Northwest Washington Native management of salmon, which due to legal restrictions remains unpublished. 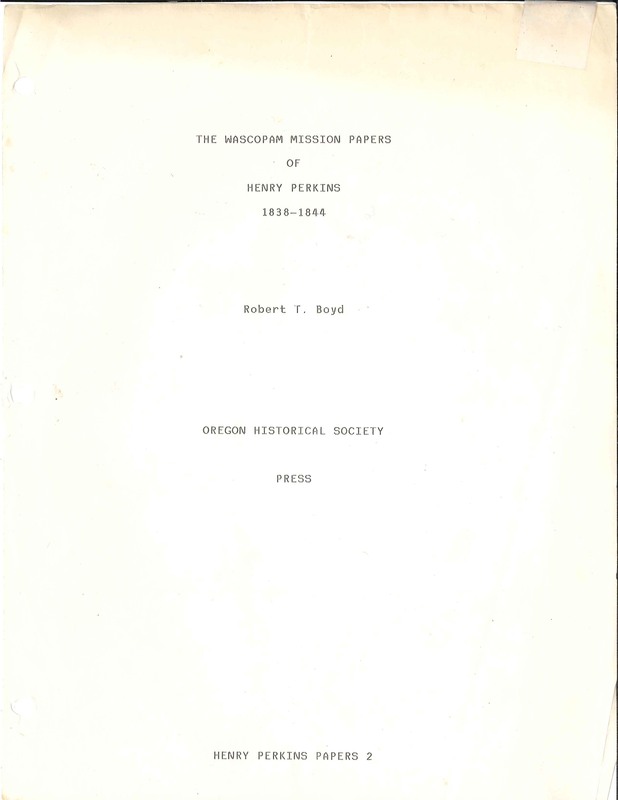 Between 2004-07 I completed, under contract to Columbia University Press, 324 single-spaced pages, through 1850, of an ethnohistory of the Native Americans of Washington and Oregon. But the project was never funded and eventually I reluctantly had to leave it behind and concentrate on paying work. Despite remaining uncompleted, writing the Columbia manuscript was a wonderful exercise in pulling together, analyzing and interpreting all my sources, and I continue to return to it as a touchstone and reference for my ongoing research into more narrowly-focused and problem-oriented research.